Cambus Medical employees raised €5,500 through the course of 2015 in support of mental health programs & men’s cancer awareness. 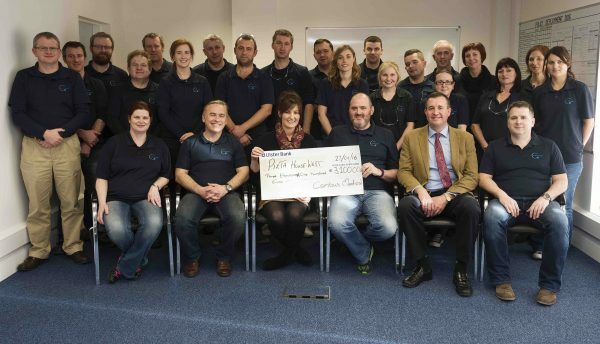 The 100+ strong work force at the Galway based medical technology company organised and participated in a wide range of fundraising events including a Bake-a-ton, World Cup Fantasy rugby, Company summer BBQ, Christmas party sponsorship, Parking space raffle and participation in Movember 2015. Proceeds from the fundraising initiatives have been donated to Movember and Pieta House, the latter visiting Cambus Medical last week to receive a cheque for €3,100. Tom McEvoy, Funding and Advocacy officer for Pieta Mid West said “I would like to congratulate everyone at Cambus Medical on the remarkable effort they have put in over the past 12 months to raise so much money for very worthy causes and in particular for the €3,100 for Pieta House. “At Pieta House we tackle the issues of suicide and self harm day after day. These funds will be used to support our “Free of Charge” service to people of the West of Ireland coming to Pieta House West -Tuam who are in need of our services. For further information go to www.pieta.ie,” concluded Tom McEvoy.